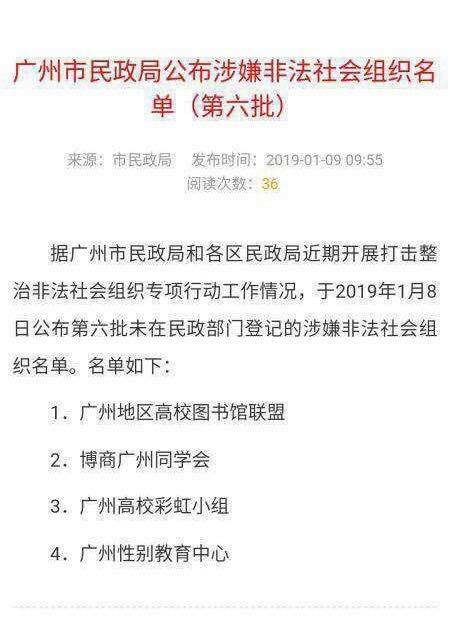 On Jan 9, 2019, the Guangzhou government released a statement on 'illegal organizations' that are banned in Guangzhou, the capital of Guangdong Province in Southern China. This is the 6th round of names released to the public. For the first time in China, two organizations working on LGBT issues were listed. No official reasons were given. Since 2016, the Chinese government has been warning against 'western style activism' and cautioned against 'western political agenda'. Public events like Speak Out (Chinese style Ted Talk), Pinkdot Xiamen, IDAHO (517 movement), and student organized events had been clamped down repeatedly over the last 2 years. Also, since July 2015, there has been a concerted effort by the Chinese government to detain human rights lawyers. To survive, many LGBT organizations have built closer relationships with government agencies, packaging their events with 'Chinese characteristics' and promoting their activities within the framework of family. There are several LGBT groups in Guangzhou, who have not been targeted. Since 2015, the Guangzhou University Rainbow Group has been targeted by the authorities. They were questioned by the police and stopped from holding events such as IDAHO activities and 'raising the rainbow flag in the university'. The Guangzhou Gender and Sexuality Education Center executive director, Wei Tingting, is a well known queer feminist in the LGBT and women's movement. She was detained for her street protest against domestic violence and sexual abuse. Recently, she has had a number of successes fighting for gender marker changes in official documentation for transgender persons. Many activists have different theories about why these LGBTIQ groups were singled out. In addition to the rapidly shrinking civil society space in China, OutRight views the recent ban of the two Guangzhou University groups as related to their style of activism that China’s government disapproves of, such as street style public organizing, which is viewed as confrontational and disrupting harmony in society. The government’s crack down could also be a response to the recent rise in Chinese student activism on labor rights in China. The Guangzhou University Rainbow Group and Guangzhou Gender and Sexuality Program could also have been targeted because of their work with women's movements, and involvement in the #metoo movement which could be seen as a 'western political agenda'. What does it mean for these groups going forward in 2019? “This can be seen as a setback for LGBT rights in China. Moving forward, groups will have to adapt to the new landscape on the rapidly shrinking civic space. But that is not to say that there are no opportunities to advance LGBT rights in the country. However, in order to survive, groups will have to try harder to engage the authorities on the lived realities of LGBT persons in China and work cross-sectionally with other human interest groups,” says Jean Chong, OutRight’s field program coordinator for Asia region.